Leonard (Len) Scioscia of Newark, New Jersey joined the Little Flower board in 2013. He graduated from Penn State University in 1976 with a bachelor’s degree began his insurance career in 1977 as a Loss Prevention Representative with Liberty Mutual. 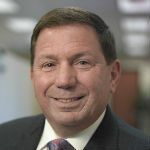 In 1978, Len accepted a position with CNA Insurance in Cedar Knolls, New Jersey, which lead to a promotion as Loss Control Manager in their New York City regional office. In 1982, Len was promoted to Marketing Manager at CNA. In this capacity, he supervised the activities of a field staff responsible for directing profitable growth through New York City insurance brokers. In 1984, Len was promoted to Sales Manager of CNA’s Melville region. Leading a staff of eight, and more than 100 agents and brokers, he was responsible for the growth and profit of an office generating more than $200 million in commercial and personal insurance premiums. In 1986, Len accepted the position of Executive Vice President of the Edward F. Cook Agency in East Hampton, New York. Len’s early responsibilities included the development of a robust sales culture and expanding the operating footprint of the firm. In 1990, he was promoted to President and Chief Operating Officer and played a central role in the agency’s 1998 merger with the Hall Agency of New York and the Charles E. Hyde Agency of Port Washington, New York, to form Cook, Hall & Hyde, Inc. In January 2003, Len was appointed President and CEO of Cook, Hall & Hyde, responsible for directing the profitable growth of its three primary brokerage businesses: Commercial Insurance, Personal Insurance, and Group & Financial products. Len also served as Chairman of the Cook, Hall & Hyde Board of Directors and Chairman of the Executive Committee. In 2012 Len was integrally involved in the merger of Cook, Hall & Hyde with Maran Corporate Risk Associates. The resulting firm, Cook Maran & Associates, ranks as one of the 100 largest insurance brokers in the nation with offices across Long Island and New Jersey. Len is the President and CEO of Cook Maran and also chairs its Board of Directors and Executive Committee. In his role as CEO, he is primarily responsible for optimizing operating performance, strategy, synergy, talent acquisition, strategic alliances and large financial transactions. Len earned his Chartered Property Casualty Underwriter (CPCU) designation in 1983, and his Certified Insurance Counselor (CIC) designation in 1994. He served as CNA’s National Pacer Chairman (agent’s advisory board) in 2004 and has been a member of numerous insurance carrier advisory committees, including Travelers Producer Council, The Hartford Insurance Product Development Advisory Board and St. Paul’s Top Brass Advisory Board. He sits on the board of First Empire Securities, a broker dealer serving institutional clients such as credit unions, banks, municipalities and insurance companies. Len is married with two children. He has been active in organizing and coaching youth lacrosse in East Hampton, is an avid sports enthusiast, is a member of the East Hampton Kiwanis, and pursues numerous other local community-oriented and philanthropic interests.